Nothing but end zone ahead for Evan Gwozdz (12). He passed for four TDs and ran for two others. (Foxboro MA) I guess I’ll never know. Know what? 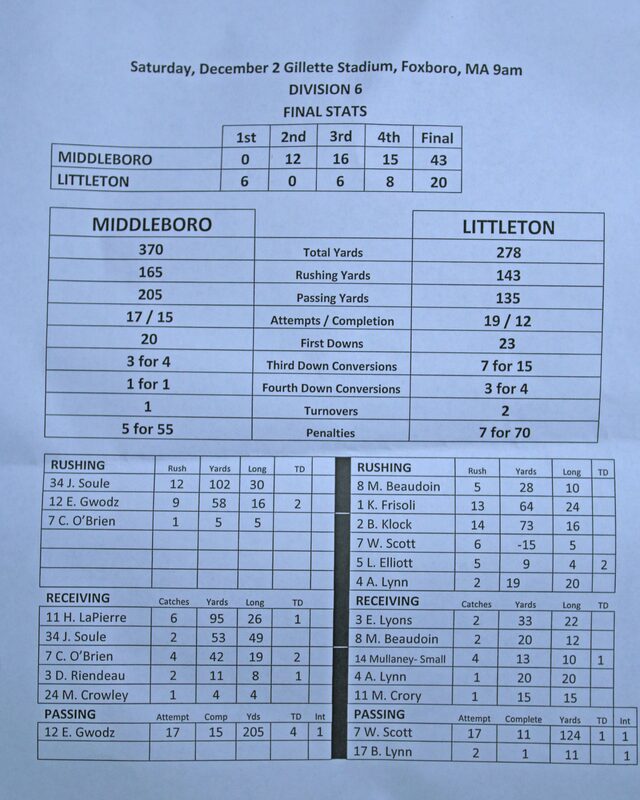 Who the punters were for Middleboro and Littleton. 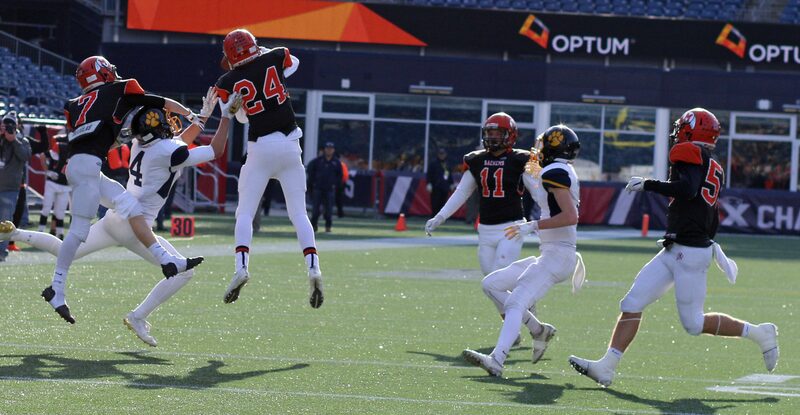 No need of them as the two Division Six finalists vied for the 2017 football state championship in the “sunrise” game at Gillette Stadium on Saturday morning. 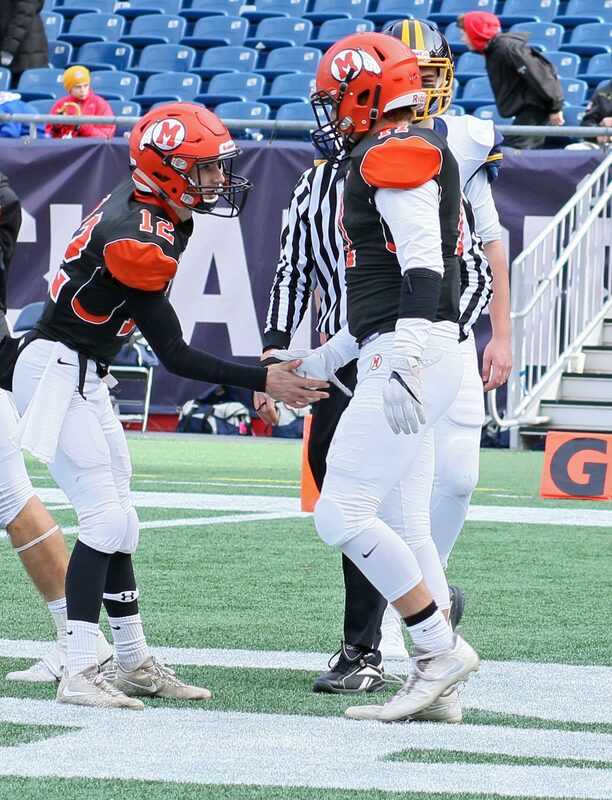 Tons of offense (628 yards between the two of them) but it was the point-producing offense of Middleboro that carried them to a 43-20 title. 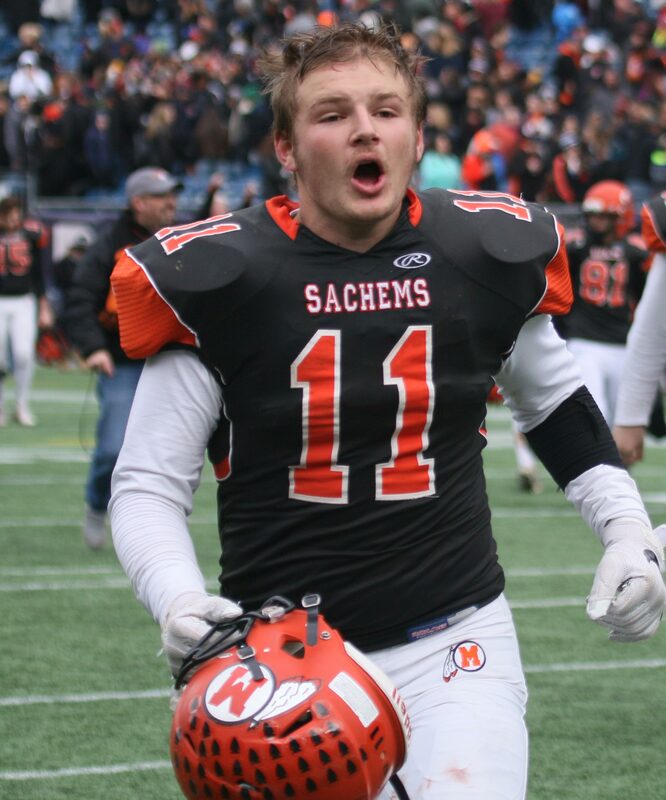 Evan Gwozdz was the star of the show for the Sachems (10-3). The 5-8 senior passed for four TDs and ran for two others. Unlike his number-sake (TB12 of the Patriots), however, Evan also showed up in one of my pictures in the “good hands” section of Middleboro’s kickoff return team. No surprise on this day, Evan recovered the onsides kick! Anyone sitting through the first quarter of this game might not have been certain that Middleboro would even win it. Why? Littleton (11-1) controlled over 90% of that quarter (20 plays) and had the only points on the board. Harrison LaPierre snuffed out Brad Klock’s two-point conversion attempt. 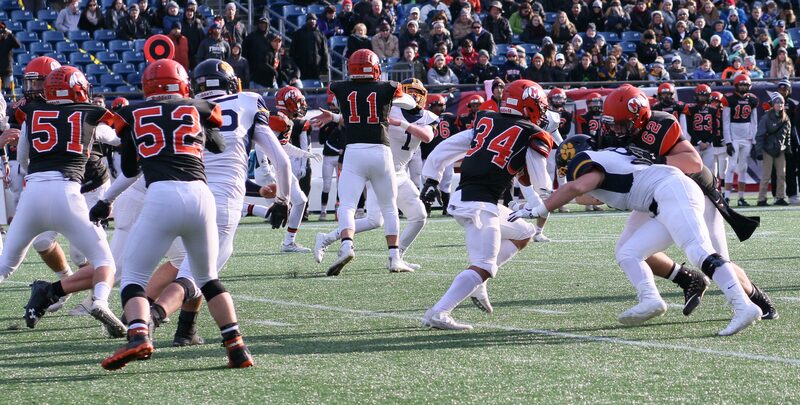 When Middleboro finally did get a chance on offense they quickly showed that they would be a handful to defend. “We like to get the ball to the perimeter and we are fast,” said MHS coach Paul Kingman afterwards. You put a fast team on the extremely fast surface at Gillette and containment will be tough. 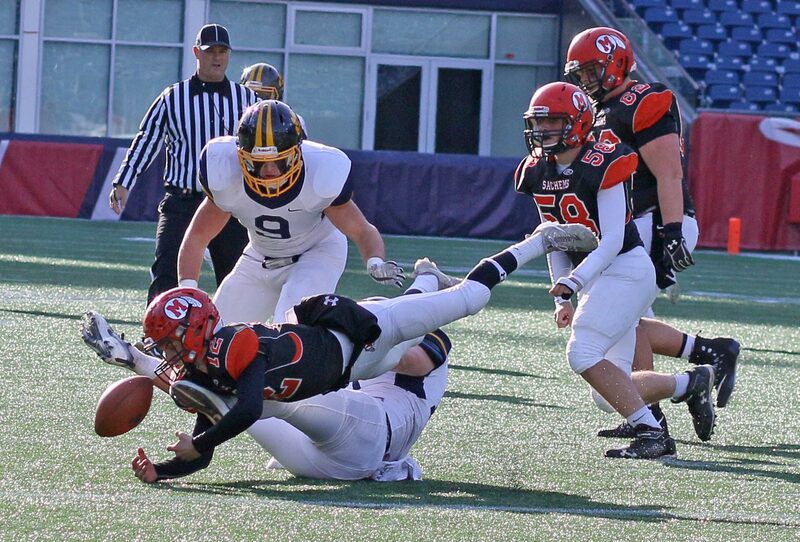 The strategy of Middleboro was to let the Littleton defense determine their attack. “If they (Littleton) were going to shut down Jeremy (Soule) we would pass and if they defended the pass we would run Jeremy,” explained Evan. That strategy worked to perfection in the final three quarters. 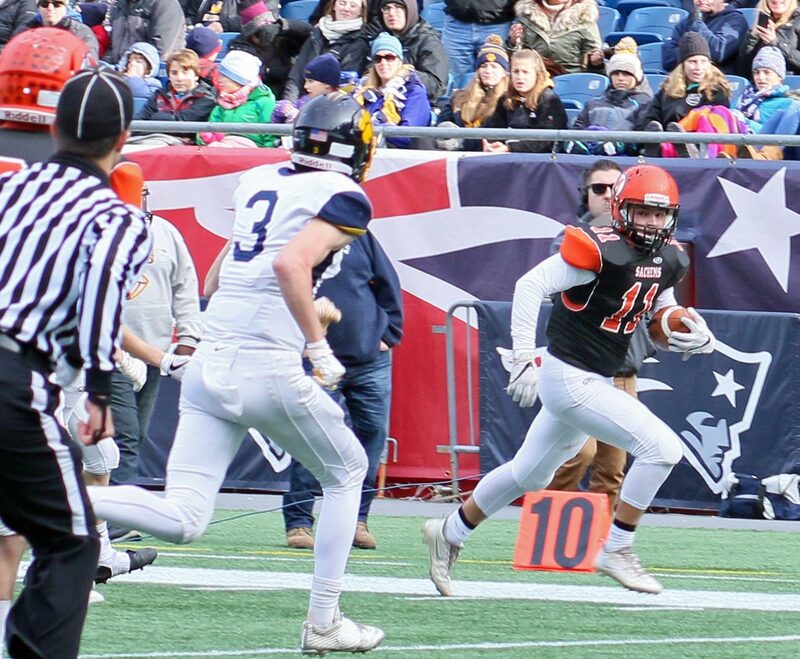 Jeremy Soule collected 102 yards on 12 carries while there were fifteen catches, and four touchdowns, among five Middleboro receivers. 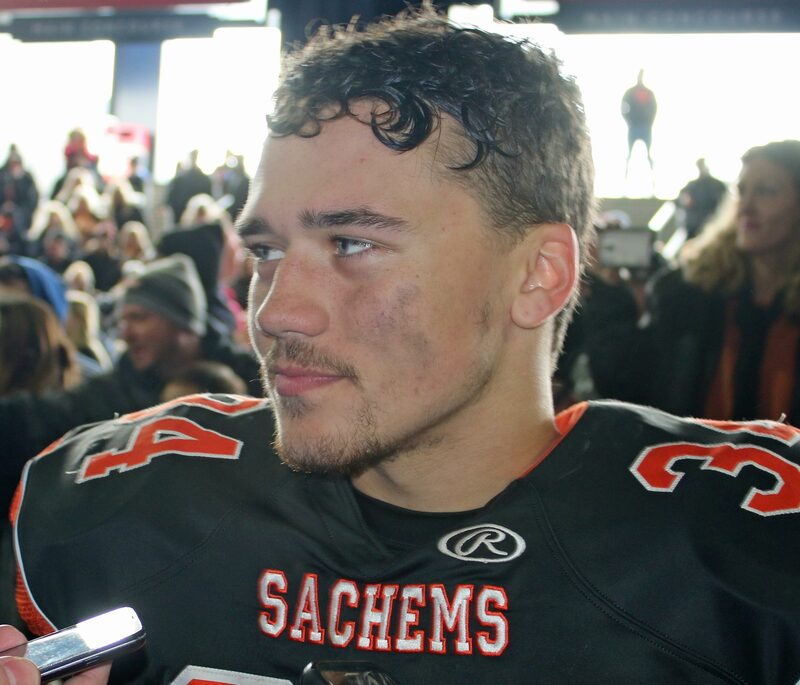 It was one of those days in which, after the first quarter, Littleton was competitive but not able to neutralize the Sachems on either side of the ball. I thought that Littleton, after the first quarter TD, would always be able to put long marches together and answer Middleboro TDs. But that Middleboro quickness on offense showed up on defense too. There was a remarkable turnout of Middleboro support. That will happen when a town realizes that a thirty-four year football state championship drought could end. Evan Gwozdz (15-for-17) had two incompletions. One was a spike to stop the clock and the other was a prayer at the very end of the first half. Those three onsides kicks by Littleton in the second half not only failed but they gave the quick-scoring Sachems half a field to work with each time. I know, that’s second guessing of the highest order. One of the luxuries of doing a game at Gillette is that you get to see instant replays. A couple of decisions by officials drew some serious groans from each team. One time, Littleton was assessed a penalty for a sideline’s hit. The replay showed that there was hardly contact. 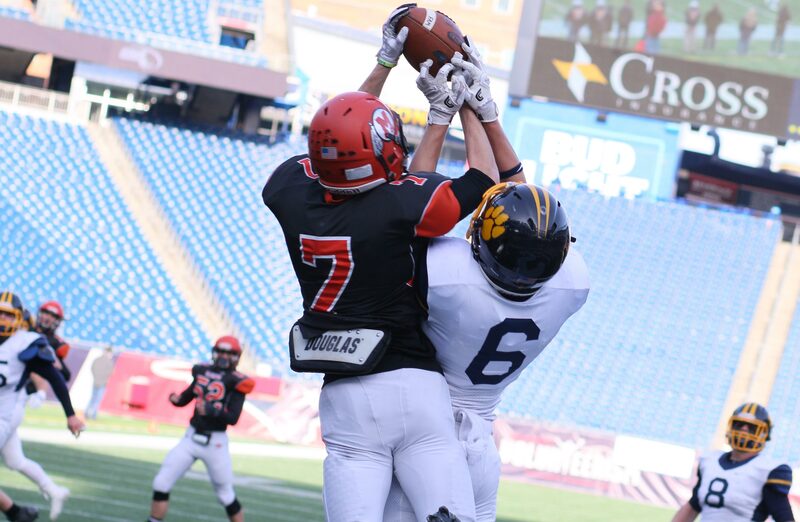 Another time, Middleboro had an interception denied when the replay suggested otherwise. Turned out to be an excellent day for December football in Massachusetts. 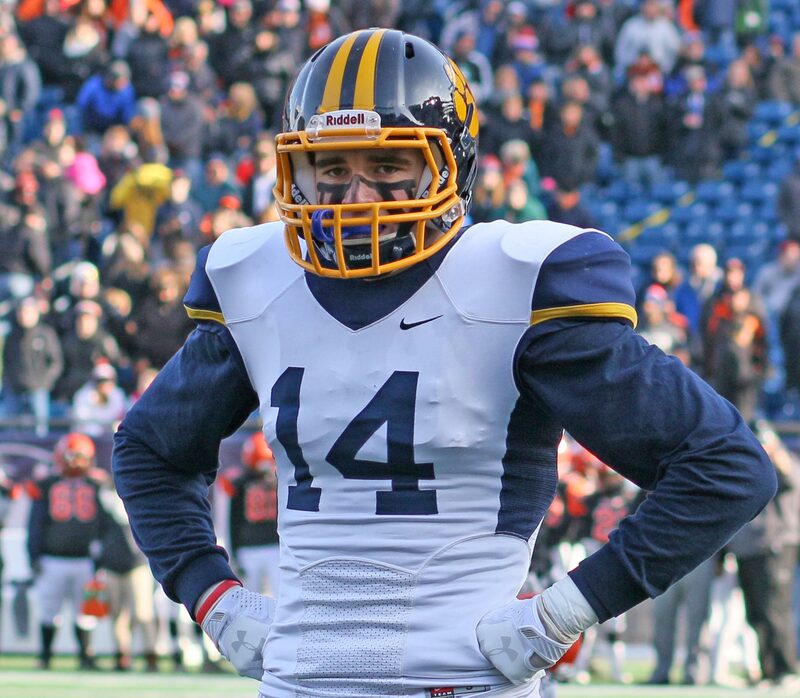 A win by Littleton would have enabled them to be the first Central Mass team to win two state championships. 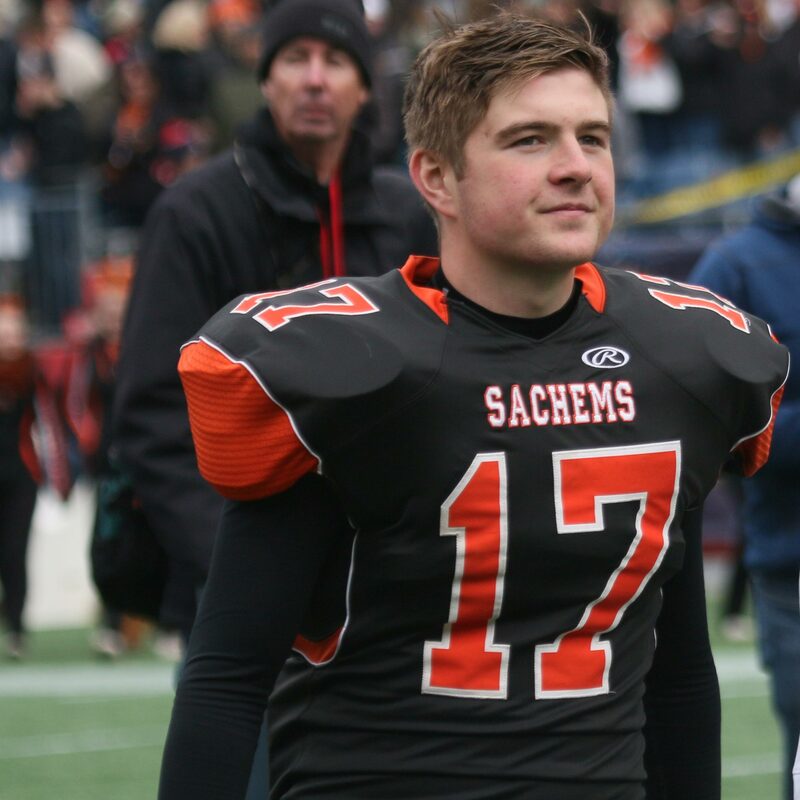 Colin O’Brien’s two touchdowns give him twelve for the season. 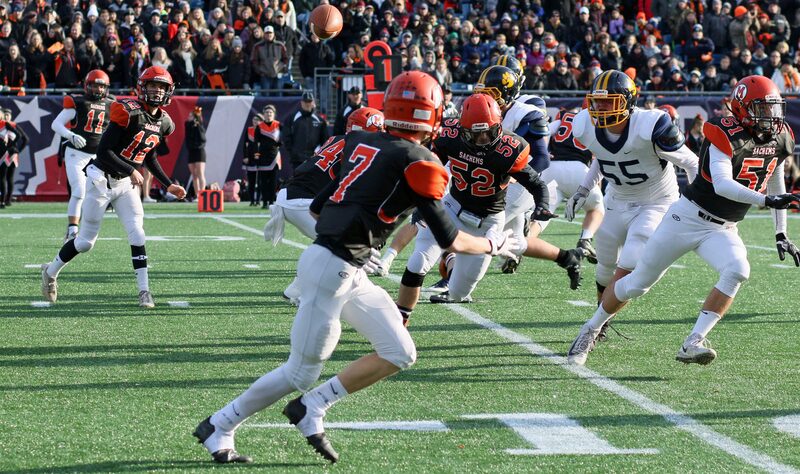 Evan Gwozdz finished this season with sixteen rushing touchdowns and twenty-two passing touchdowns. Amazing numbers! Second guessing that didn’t materialize was over Coach Kingman’s decision to rest all his starters against Carver on Thanksgiving Day and take a loss versus Carver. 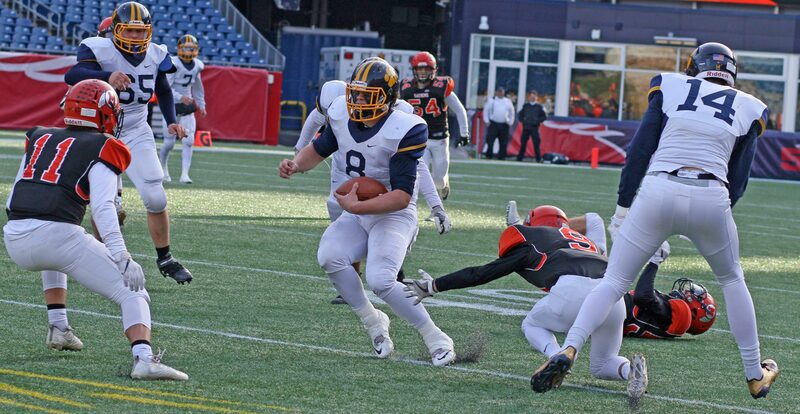 Today was Littleton’s third trip to Gillette in the past five years. 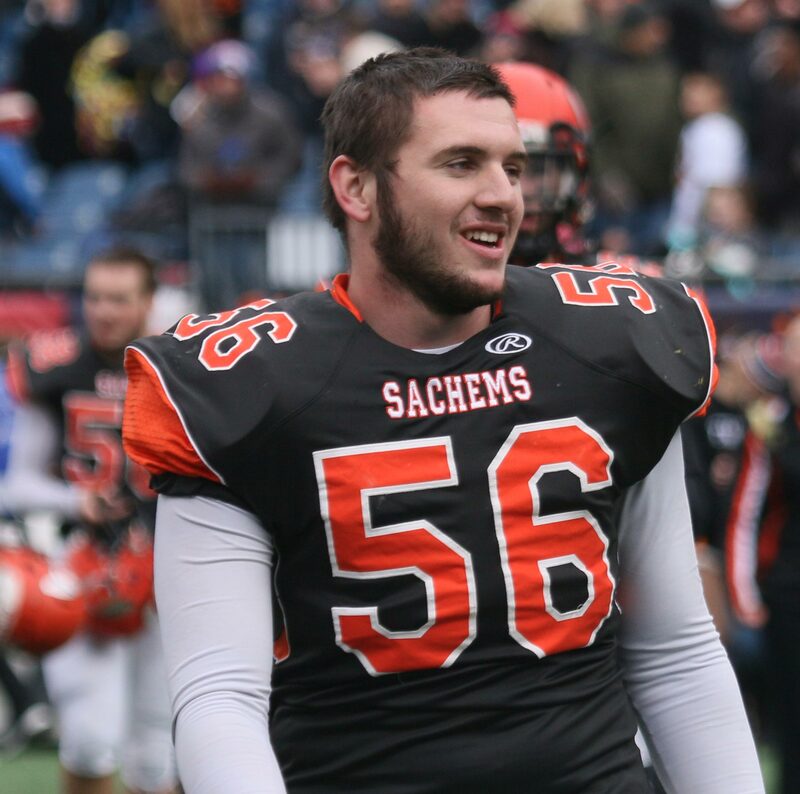 Middleboro’s Pat Kingman has had the Sachems in the playoffs the last four seasons. 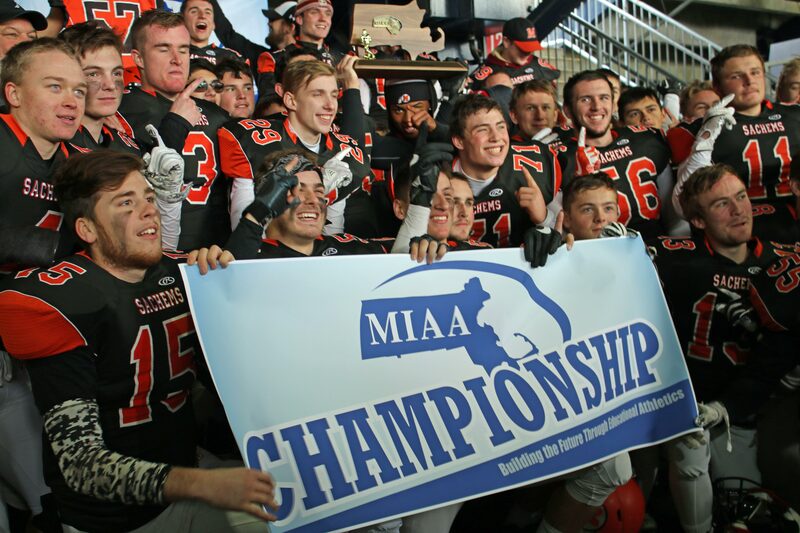 Middleboro’s three previous state championships were in 1983, 1978, and 1977. 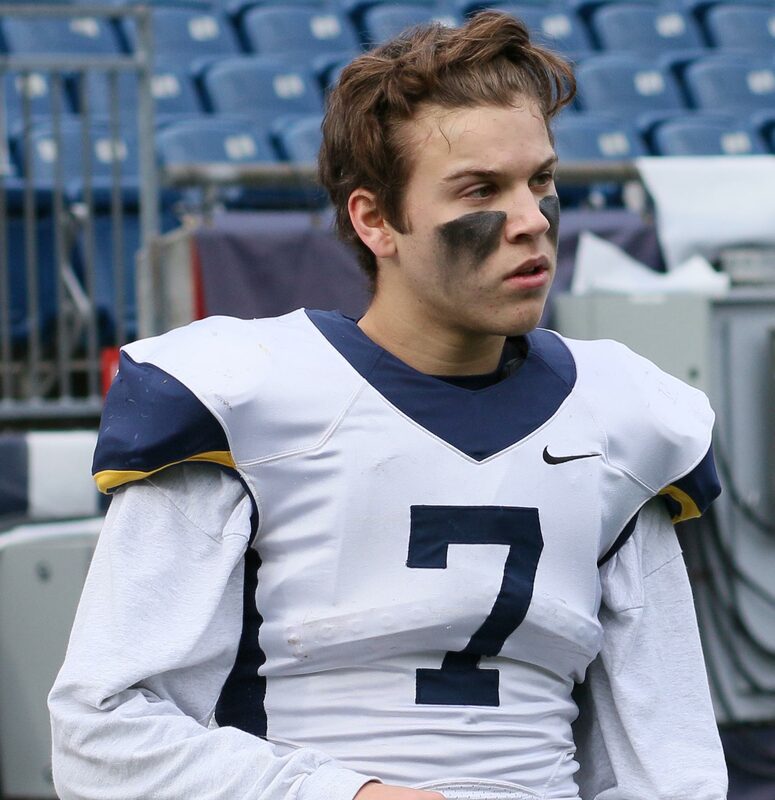 In the state semifinal game, Jeremy Soule had seventy-six yards on his first touch and totaled 246 yards in 13 carries including two touchdowns. 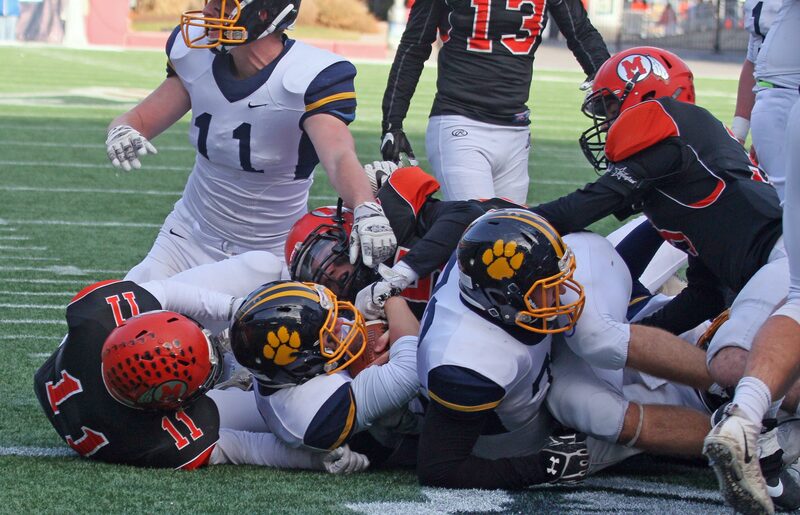 Littleton won their last state title in 2013. They were undefeated in 1967, 1968, and 2013. The Tigers are in the Midland-Wachusett League. 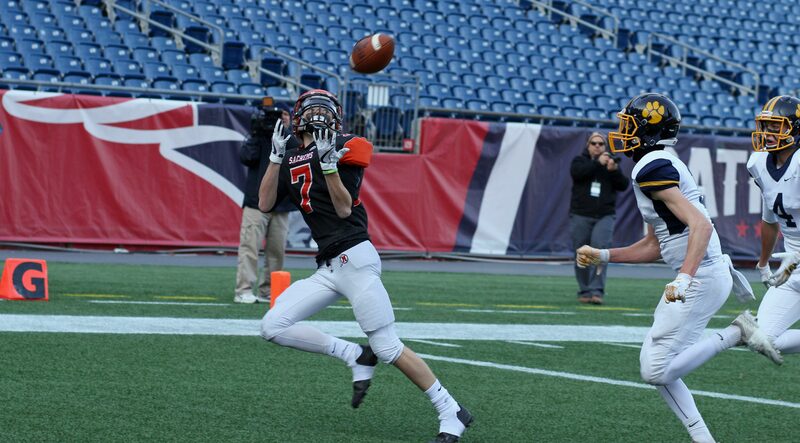 Middleboro opted for a trick play after their sixth touchdown. Evan Gwozdz was the holder and Brandon Buote was the kicker. Instead of holding the ball, Evan flipped the ball over his head to Brandon who swept right to gain two points. This was my first time in Gillette. Just the size of the complex is remarkable. Trying to find my way around was an adventure but I managed. I was well treated and well fed. Their after-game stat sheet is a Godsend. 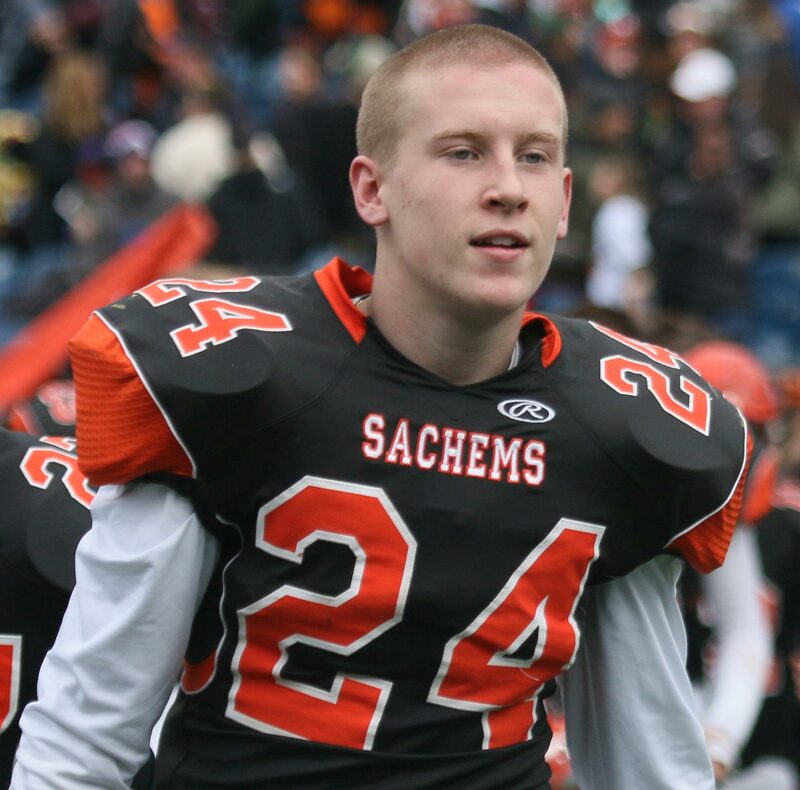 Evan Gwozdz (12) faces an onsides kick………and recovers it.